Update: McCainalanche and a Hogelanche. Cool beans. So yesterday I drove up to Maryland in order to observe today’s hearing in John Hoge v. Bill Schmalfeldt. As regular readers will know, Schmalfeldt is facing five different criminal charges related to his harassing conduct towards Lee Stranahan and Mr. Hoge, and Mr. Hoge decided to file for a peace order against Mr. Schmalfeldt. As for the cast of characters, Brett Kimberlin did show up. Whereas normally he made sure to wear a professional suit and usually had his hair short, this time he was dressed in a ratty looking coat and his hair was long and disheveled. The thought that immediately came to mind was that he looked like a homeless man and Mr. Hoge concurred later. Previously I told Mr. Hoge to be ready for Mr. Kimberlin to attempt to intervene in the case. After I saw Kimberlin in this state, I told Hoge that I doubted Kimberlin would attempt to intervene. Update: Well, it would help if I actually included the cartoon I meant to, toward the end! So that is fixed. I am presently working it out with Blogger, and if they don't re-post it, we will find a new home for the information. Sooner or later, Team Kimberlin will understand what the Streisand Effect is. By the way, Schmalfeldt might want to look up Md. Criminal Law Code §9-305 dealing with intimidation of a potential witness. It is a misdemeanor, but it carries a potential punishment of five years in prison. Because Maryland has a cockamamie definition of “misdemeanor.” And for that matter, he might want to examine the rules on destruction of evidence. Share it far and wide, friends! But rather than talk about his gulaging, I wanted to share with you when he decided to fisk my Mission Statement on for my blog Everyone Draw Mohammed. Since then I took it private and then bizarrely google literally deleted everything from it and I have never found out why. It couldn’t be over offensive material, because they didn’t do anything like that during the Everyone Draw Mohammed day movement itself, so... maybe it was a function of being private and inactive for a few months? Who knows? So as I have told you, Bill Schmalfeldt has been pressing bogus copyright claims against me and Lee Stranahan. How bogus are they? Schmalfeldt has said specifically on his radio show that Lee Stranahan’s use of audio was “fair use” but is threatening to sue him for copyright infringement anyway. And for that matter, he has thanked me on air for his coverage, meaning he can’t claim any damages based on copyright infringement. He’s a real genius, that one. So I find out today that despite my challenges to each of his claims, YouTube has suspended me. Apparently it only takes two complaints, however bogus, to get a YouTube account pulled, most likely operating by some algorithm. I am working to get this decision reversed, but in the meantime, I can post it on my blog and Blogger is very good at being resistant to bogus complaints. I should know, it handled the Everyone Draw Mohammed Day protest far better than Facebook (which is why I don’t use Facebook). So what videos has he temporarily successfully suppressed? Well, first up we have one I called “Bill Schmalfeldt and the Law of Copyright.” It features commentary on how Bill Schmalfeldt himself regularly violates the copyright of others, particularly the owners of the Simpsons, in the introduction to his radio show. So just to review, Bill Schmalfeldt, the BS man himself, made a threat on his radio show and then later doubled down on it. And then on Friday, he tried to explain way his threats. Big picture, what the BS man is trying to do is have it both ways. On one hand he revels in engaging in threatening talk and behavior. On the other hand when you call him on it, he then wants you to believe that he didn’t intend any threat. He won’t say what is coming. He won’t say who will be delivering it. But we should just trust that he is a really good person (who defends a criminal and makes pedophilia jokes) and he would never do anything vile to his enemies, even though he is associated with a convicted terrorist. And then for bonus points, when alleged other parties threaten him he gets outraged. This is not to say that if these threats are genuine (and not sent by Bill Schmalfeldt or one of his allies with his knowledge), he would have no right to be outraged. But the hypocrisy is a sign of his dishonesty, although in this case it might be the case that he is not being honest with himself and what he is actually doing. To review, Bill Schmalfeldt is facing five criminal charges in Maryland filed by Lee Stranahan and John Hoge all related to some kind of harassment. I have seen the charges in both cases and this is not an attempt to stop Schmalfeldt from talking about Lee or John. This is about Schmalfeldt’s repeated attempts to contact these men, by email or other electronic means, even after both men specifically told him to stop and other harassing conduct that is not protected by the First Amendment. So yesterday, I reported on Bill Schmalfeldt’s thuggish attempt to silence me with a bogus copyright complaint. To review, I have been putting up a number of clips from his show on YouTube to report to my readers and viewers the news of what he said, to comment on it and indeed to criticize it. Bill Schmalfeldt sent a bogus and harassing notice claiming I was violating his copyrights and announcing he had asked YouTube to take down the video, despite the fact that this clearly fell under the fair use doctrine. And I told you that his claim was dishonest. But on that point, I have been saving the coup de grace. You see, Bill Schmalfeldt is not exactly consistent in his belief that we should respect the copyrights of others. More video from yesterday’s show (meaning February 20). Toward the end, he engaged in a deep throated defense of Brett Kimberlin. To put it in a little context, he was talking about a Tweet where someone referred to a “buddy” of his who went to prison. Schmalfeldt logically deduces that they were referring to Brett Kimberlin and he goes on to address the claims that he is friends with, or associated with, Brett Kimberlin. And you have used audio from my copyrighted internet radio show that explicitly states at the end of every episode, "Blood on the Microphone is a presentation of Deep Brain Media, Copyright Bill Schmalfeldt, All Rights Reserved." I have already filed a copyright complaint with YouTube, but you can show you are capable of understanding copyright law by removing these videos and images, posted without my permission, immediately. My growth as a blogger continues apace! Today I am going to demonstrate that I have learned to create YouTube videos using audio files and one creepy picture of Bill Schmalfeldt and one of Neal Rauhauser. Oh joy! So yesterday Bill Schmalfeldt recorded a radio show. He has a radio show where he brags of being listened to by a maximum of five hundred listeners and that was on a big news day for his show when he got charged with a crime. In any case, on that show he did something he often does: he said something stupid. Actually it was beyond stupid. It was, in my opinion, potentially criminal conduct. He threatened several people, including a Deputy District Attorney of Los Angeles. Now for transparency’s sake, here’s a link to the show, so you can listen and verify all of this yourself, because I can imagine him claiming I have selectively and deceptively edited the audio. So listen for yourself and decide if you think I have failed to include sufficient context. And there is a lot of interesting stuff in the program if you happen to the whole thing. So a few minutes ago, I got an email from the BS man himself, Bill Schmalfeldt a.k.a. The Liberal Grouch. Attentive readers know that I have recently invoked Maryland’s general harassment and electronic harassment statute sending him a notice by email to stop his harassment of myself and others, and even posting the notice on my blog. You can read the notice, here. Well, he has since violated this statute several times, emailing me once and tweeting to me several times. He also threatened me yesterday on his radio program, and although that threat was not transmitted to me via email, that is still harassment under the general harassment statute (read here for more information about both statutes). I will talk more about his threat momentarily in a new post. But just tonight I get a fresh violation of the statute when he emailed a simple message. The subject line was DENOUNCE IT OR OWN IT! And it included a screencap of this tweet. 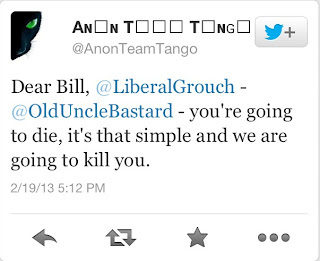 So apparently someone sent him this threat and it is as clear a threat as you are likely to see. Incidentally, this is how I got that screencap. The account in question was suspended—and good for Twitter for acting swiftly on that one—but I was able to use an old trick to see the tweet in question anyway. Specifically I found a couple of people responding to the tweet on my phone app, then I scrolled up to see what they were responding to and the tweet was still there, allowing me to screencap it. Well, Bill Schmalfeldt is included among “some people” and thus my specific denunciation of vigilante threats or violence applies to Schmalfeldt, too. I do not want to see vigilante threats or violence against any person, including Schmalfeldt. But Schmalfeldt likes to play this game a lot, declaring that if you don’t answer his questions or his attacks, he will take that as confirmation of the absolute worst interpretation of events. Update: Hey, cool, I have an McCainalanche! (Meaning a link from McCain. No, not Meghan McCain, the other McCain!) Teasing aside, it is greatly appreciated. And visitors might also want to check out my last post where I prove that not only does Bill Schmalfeldt refuse to do basic journalistic due diligence before writing a negative story, but he lies about having done so. Yes, really. In brief review, last Tuesday Lee Stranahan had enough of Bill Schmalfeldt’s harassment and filed charges against him under Maryland’s electronic harassment statute as well as their general harassment statute. And on Saturday, Bill Schmalfeldt wrote a long “open letter” in which he claims that as a journalist he has a right to do these things. Here’s a safe link to that piece. I talked about this letter briefly in my last post, and in this post I want to focus a little more on it. Twitter, Facebook, e-mail… they are all marvelous technologies, Lee. And they all have one thing in common. You have the ability to block incoming messages from people you do not wish to hear from. So… the only way you could be aware of ANY message I sent you is that you chose to either NOT block me, or you chose to GO LOOKING for things I’ve written about you. Okay so last Tuesday Lee Stranahan had enough of Bill Schmalfeldt’s harassment and filed charges against him under Maryland’s electronic harassment statute as well as their general harassment statute. In a long, “open letter” Bill Schmalfeldt claims that as a journalist he has a right to do these things. Here’s a safe link to that piece. Except Bill Schmalfeldt isn’t a journalist and I am going to show you the proof. These are public documents, tweets, etc. but I have never highlighted them to you before to show you what they reveal. (a) "Electronic communication" defined. -- In this section, "electronic communication" means the transmission of information, data, or a communication by the use of a computer or any other electronic means that is sent to a person and that is received by the person. (3) a person specified in a court order directing the provision of information, facilities, or technical assistance to another who is authorized by federal or State law to intercept or provide electronic communication or to conduct surveillance of electronic communication. (d) Exception. -- This section does not apply to a peaceable activity intended to express a political view or provide information to others. (e) Penalty. -- A person who violates this section is guilty of a misdemeanor and on conviction is subject to imprisonment not exceeding 1 year or a fine not exceeding $ 500 or both. As I am sure you can see, §3-805(b)(2) states that the law is not violated until the person asks you to stop. And then any further communication after that request violates the statute if it meets the other elements of the law. Consider this email my request to you to stop. Do not contact me, do not contact my family, do not contact my friends and associates with harassing messages. Please note that the statute allows me to inform you to stop not only on my own behalf, but on the behalf of others and I am exercising this right. I cannot give you legal advice, but I am informing you of how I interpret this statute. I will also recommend that you consult with an attorney to make your own determination of how the statute might or might not apply to your conduct. But I will interpret any form of directed communication to be in potential violation of the statute, and I will treat it as such. This includes including emails, twitter “mentions,” facebook messages, even comments on any blog I administer or administered by any of the people I have just told you to leave alone. Let me expand for a moment on this point about twitter. By “mentions” I am referring to placing the handle of another person in a tweet causing that person to receive your tweet. So if you simply write “Aaron Walker aka Aaron Worthing is a jerk,” I do not interpret that as a directed communication in potential violation of the act. But if you write, “Aaron Walker aka @AaronWorthing is a jerk” you know that this causes twitter to send a message to me even if I am not following your feed. The first example, in my interpretation, could not possibly be a violation of this statute; the second example could be, if the other elements of the statute are met. Do not even reply to this email, because I doubt you will be able to restrain yourself. Just simply stop. Again, I urge you to consult with independent counsel to make your own determination of how the statute might or might not apply to your conduct and how to conform your conduct to that statute going forward. Well, all three email addresses bounced back as undeliverable. So literally the only purpose of this post is so I can deliver this message to Schmalfeldt and so the rest of you can see what is going on, too. Transparency and all of that. I will tweet out a link to him and we will see if he obeys the law. This is one of those cases where I have known of something happening, dear reader, but I was holding it back. On Tuesday evening, as the President was giving us the SOTU and the Chris Dorner story was coming to its fiery conclusion, I met with John Hoge and Lee Stranahan for dinner. Lee had flown into the area for the purpose of filing charges against Liberal Grouch, a.k.a. Bill Schmalfeldt for ordinary harassment and internet harassment and he did file those charges when we were done eating. I was there to observe and because I had never met Stranahan in real life before. Of course regular readers are aware of the kind of ugliness that Schmalfeldt has publicly spewed about Lee Stranahan and my friends. Here is where I showed how Occupy Rebellion threatened to reveal where Lee Stranahan lived so his wife could be raped while he was at a political convention, and how Schmalfeldt then carried through on that threat to reveal where Stranahan lived. Here is where Schmalfeldt threatened to sue me for truthfully reporting about his conduct and then offering a negative opinion about it, proving beyond any reasonable doubt that he is an anti-speech thug. Here is where his harassment of Lee Stranahan drove Lee to abandon his home. Here is where he tries to threaten Patterico’s job based on statements he claimed was libelous… after previously admitting they were not. And most recently, here is Schmalfeldt going after Stranahan and his wife, regarding the death of their daughter in childbirth. So Lee had just about enough at this point and he had made a discovery. There as a very specific law in Maryland that deals with harassment by electronic means. As regular readers know I have written extensively about the law of harassment in Maryland given Brett Kimberlin’s abuse of these laws when obtaining peace orders against me, often using perjured testimony. This statute is virtually the same thing, only with two differences: 1) it is limited to electronic communications directed at another individual and 2) it has a much stiffer sentence. Update: A lot more about events leading up to the firefight, and a tragic detail about the sheriff’s deputy who lost his life tonight. I was busy tonight, missing out on the State of the Union and apparently the breaking story that the Police believed that they had Dorner trapped in a cabin when the place went up in flames. Look, I have followed breaking news stories before, and a degree of caution is always wise. I remember when those miners were trapped in West Virginia, and initial reports were all but one of the miners were rescued. The truth was all but one died, which left the families going from sudden hope, to crushing despair. And I remember just after the massacre where Gabby Giffords was wounded, that initially she was reported dead, and if memory serves, Judge Roll was reported to be in all sorts of states between life and death until people sorted things out and learned he died heroically. And for that matter, I remember the wrong Lamza being identified as the killer in Newtown, resulting in a man who lost his mother that day getting a lot of ugliness on the internet. You always have to be careful in these things. An LAPD spokesman says no body has been pulled from the cabin in Big Bear, Calif. and any reports — like the Associated Press story below — are “not true.” The spokesman said the fire at the cabin is still too hot to search. I have heard some suggestion that part of the problem is the concern that some of the ammo might explode. It’s not very well verified, but it is such a reasonable possibility… it seems likely. Indeed, just as I wrote that last line, I got a “breaking news” email from CNN stating that Cindy Bachman, a spokesman for the LAPD said that, “They believe that there is a body in there, but it is not safe to go inside.” Which somewhat conforms with that rumor, but it still isn’t sourced very well. However, there is no truth to the rumor that this is taking longer because it takes a while for the police to drink enough water to p*ss on Dorner’s corpse. By the way, I will note that while I do not celebrate the deaths of mere political enemies and the like, I never hesitate to celebrate the death of truly evil men, such as dictators, terrorists and truly heinous murderers. I did celebrate a little on twitter tonight, but I will hold back until it is confirmed that he is dead. And keep checking back and scrolling down for updates. I have written extensively about Chris Dorner (here, here, here and here). In doing so, I have pointed out the evil of the man’s alleged acts, while it is looking a lot less like he deserves the “allegeds” I keep sprinking in these pieces. Specifically I pointed out that he claimed to have been wrongly fired, for which he didn’t allegedly harm the people who carried out the firing, but the daughter and fiancé of his lawyer, Randall Quan, because he felt he didn’t do a good enough job representing him. Here’s a picture of Quan himself. My prayers go out to you. I mean, we do not even allow for the punishment of the families of traitors. But Dorner has allegedly murdered the family (and fiance) of a man who tied to help him. And on top of that, his supposed grievance is built on a lie. As I point out here, the overwhelming weight of the evidence says that the police brutality he claimed to witness didn’t actually occur. And now today we learn that Dorner called Randall Quan and taunted him over the deaths of his daughter and her fiancé. So yesterday at Brooks Bayne’s site The Trenches they choose to post his grand conspiracy theory of why we are picking on poor little Brett Kimberlin. And their explanation? It was to cover up a crime most foul: illegal wiretapping! It starts with the ACORN stings. You might remember them. James O’Keefe and Hanna Giles, working with his Veritas project, appeared in various ACORN offices across the country in hidden camera investigations, pretending to be a pimp and prostitute, looking for tax help in setting up a brothel for underage Salvadoran girls who would work in said brothel as prostitutes. There is no truth to the rumor that they would name it the Menendez House. And joking aside, rather than be completely horrified by what O’Keefe and Giles were pretending to be planning to do, ACORN staffers provided a disturbing amount of help, which became a national scandal, resulting in legislation cutting off all federal funding to them and ultimately destroying them as a corporate structure. In the first video from the ACORN series, the Baltimore, MD branch was the target. The fatal mistake that O’Keefe, and by extension, Breitbart, made, was apparently not realizing that Maryland is a two-party consent state. For those unfamiliar with the term, a two-party consent state means that when someone is being recorded with either an audio or visual device, they have to explicitly give their permission to be recorded. In most states with such laws, the clear presence of the recording device and the subject communicating with the interviewer is viewed as consent. However, as anyone familiar with the story knows, the ACORN employees in all the offices were apparently never made aware they were being recorded. In short, in Maryland, O’Keefe broke the law in order to get his damning evidence. The problem is that the entire paragraph is false. O’Keefe did not break the law in his recordings. Sure, many of you "law enforcement experts and specialist[s]" will state, "in all my years this is the worst........", Stop!!! That's not important. Ask yourselves what would cause somebody to take these drastic measures like I did. That's what is important. Conservatives like myself have argued in the past that the tendency on the left to automatically sympathize with terrorists, to assume that they are motivated by some kind of injustice created a bad incentive. We on the right have repeatedly pointed out that the leftward tendency to try to get at the “root causes” of terrorism encouraged people to engage in terrorism in order to publicize their grievances. But ordinarily, I admit, this is only theory. To review, Chris Dorner is the man who has allegedly gone on a killing spree. 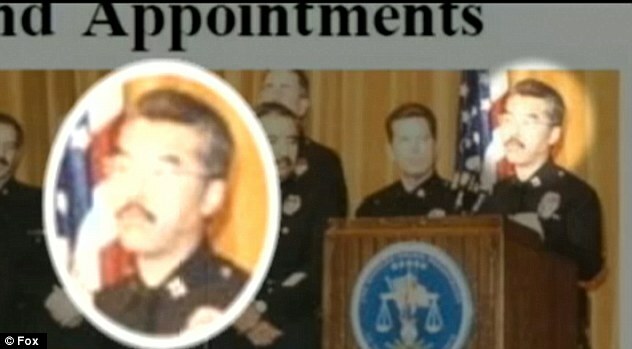 He began by killing the daughter and son-in-law of the man who represented him at an administrative hearing in which he was ultimately fired from the LAPD. He has since shot two police officers and killed a third. In addition to that, two innocent people were shot by spooked officers. It is unclear at this time whether those shootings were justified, but needless to say I am looking pretty askance at that. In addition to that, Dorner has released a manifesto which I previously analyzed. Besides pointing out a few places where he states a desire to engage in excessive force—twice getting physically violent with people because they used the n-word, and even wishing he shot two men for saying it—the other thing that leapt out at me was that the man is explicitly motivated by the hope that his terrorism—and that is what this is—would lead to changes in policy. In doing so, he was buying into a central liberal idea that terrorism was driven by injustice. He was hoping that by killing these people he would generate sympathy for the injustices he claimed to face, and he could reasonably expect that this would happen, given the way that the left has done the same thing for other terrorist acts. Conservatives have long argued that these searches for “why they hate us,” actually gave an incentive to others to resort to terrorism and in this case more than most that appears to be exactly what has happened. And last night, I examined a newspaper report that his claims of grievance were simply untrue. So all the people expressing sympathy, calling him a hero, etc. look extra dumb because now it turns out that not only was he murdering and shooting pretty much everyone but the people who had aggrieved him, but now it turned out he was lying about his grievances. So today the LAPD released some documents related to his case and it started to turn up on a number of sites, including this one. Hey, yeah, it’s not important that he is killing people that he doesn’t even allege did anything wrong to him. No the issue is he has a genuine grievance! And over and over again, he very explicitly stated a belief that this alleged killing spree would redeem his name. Well of course this catches my attention a bit, given that I was pretty famously SWATted too. For those unfamiliar with the term, let me give you a concrete example. When my friend Patrick Frey was SWATted, what happened was this. Someone called the police. Using some kind of hacker trick, they tricked the police’s phone system into believing they were calling from Patrick’s phone even though they were not. While on the phone, this person claimed to be Patrick and stated that he just shot his wife. You can listen to the SWATting call, here. Is Dorner’s (Alleged) Killing Spree REALLY the Left’s Fault? So yesterday morning, I began to hear about the killing spree being allegedly committed as we speak by Christopher Dorner. Dorner used to be an LAPD cop and if the police are correct, he is now been on some kind of revenge streak. I remember first encountering the story via SooperMexican who made the argument that this was a leftist killer. I was excited because after covering the FRC story yesterday (here, here and here), I kind of hoped we would get another story of a violent lefty to pillory those who blamed Sarah Palin or something like that for a killing. That was certainly Patterico’s approach. So I found copies of his manifesto on Gawker and this site and others, and I decided to read the whole thing. This is one of the first things to note here. This piece is written to all of us. His intention is make us read. Which means I am arguably helping him, but as we will go on, I think you will see it does serve an additional and more justifiable purpose in publicizing it. This was also apparently after the murder of Monica Quan and Keith Lawrence. Why were they killed (allegedly)? Because he had an alleged grievance with Quan’s father. He has also allegedly shot two more officers and killed a third, apparently at random, as part of his rampage. And in addition to that sadness, two unrelated people were killed shot by police who were freaked out by this whole thing. Oy vey. Update: correction added. You have seen me spar with some of the Westboro Baptist types earlier this week, especially in relationship to Ron Paul’s dumb comment on the death of Chris Kyle (see here, here and here). One of the most prominent members of the Westboro Baptist church has left it after spending her life as part of the fervently anti-gay movement. Megan Phelps-Roper, who looked after social media for the church best known for its slogan "God hates fags", announced her departure in a post on the blogging platform Medium in which she also revealed her younger sister Grace, 19, was also leaving. In the post, called Head Full of Doubt/Road Full of Promise, the 27-year-old explained how she had become disillusioned with the teaching of Westboro, which is widely considered one of the most detested church groups in America for its "God hates fags" campaign. Phelps-Roper writes: "We know that we've done and said things that hurt people. Inflicting pain on others wasn't the goal, but it was one of the outcomes. We wish it weren't so, and regret that hurt. This is an update of a story I have been following for the last few hours. First, I shared with you the revelation that Floyd Lee Corkins II, the man who shot up the Family Research Council, specifically stated when he pled guilty to the crime that he picked out the FRC based on the Southern Poverty Law Center’s “Hate Map.” I then wondered if the media would be as anxious to attack the SPLC as they were to attack Sarah Palin for supposedly inspiring violence. Then I shared video from SPLC’s Mark Potok where he declared that “there is no exoneration” for hate speech that inspires violence, as a way of further hoisting them on their own petard. Let me be clear. I don’t blame the SPLC for this man’s actions, but they blame others for this sort of thing all the time, and so it is worthwhile to hold them up to their own standards and see how they measure up. And so far they are measuring pretty poorly. And I mentioned in my last post that I called them and tried to get a statement. I haven’t heard anything from them (and I will be trying other avenues tonight), but the Washington Free Beacon got an answer. Contacted for comment, an SPLC spokesperson would not say whether the organization plans to remove the information from its website. “We are not commenting” on Corkins’ admission, said the spokesperson, who referred the Washington Free Beacon to a statement released in the wake of the last year’s shooting. This is an update to an earlier post pointing out how Floyd Lee Corkins II, the man who shot up the Family Research Council, specifically said in his guilty plea today that he picked his target off of a “Hate Map” put up by the Southern Poverty Law Center. I decided to make it a separate post because there was no good place to put it in the original, with its format. The point of the last post was to point out how shabbily they had treated Sarah Palin when they speculated that Jared Loughner might have been motivated by a map with bull’s eyes on it, and to speculate if they are going to heap the same treatment on the SPLC now that they have been directly blamed in this shooting by the shooter himself. Update: Please note that the story has juicy updates here and here. Jared Loughner , who pled guilty today to several murder charges in relation to the shooting of Gabby Giffords, said he picked his target off a "target map" posted on Sarah Palin’s Facebook page. Guess what folks, you are going to be treated to some original reporting. Usually at Allergic to Bull we restrict ourselves to merely commenting on the news gathered by others (with the giant exception being the Brett Kimberlin Saga because these involved crimes that happened to us), bringing our unique perspective and expertise. But when I read this story this morning, originally via Instapundit, I started to think maybe a detail or two were missing. He was also suspended from school, and Alexandria City Public Schools Superintendent Morton Sherman said further action is being considered, including expulsion. On Monday, the boy showed the plastic gun to at least one other student during a bus ride home from the school. The 10-year-old did not point it at anyone or threaten to shoot it, but he neglected to mention that the weapon was fake, said Alexandria police spokeswoman Ashley Hildebrandt. The toy resembled a semi-automatic handgun, said police spokesman Jody Donaldson. It was silver and had a black handle. It also had a orange tip that went into the barrel, showing that no ammunition was coming out of it. Did I or Hogewash Screw Up Raw Story? A few weeks ago, I had a post here, that talked about the arbitrariness of the prior Assault Weapons ban called Would an Assault Weapon Ban Violate the First Amendment. And it went through some of the sillier, purely cosmetic rules that determine whether a gun is would be banned. For instance, if you have a flash suppresser that serves as a grenade launcher, that is legal. But if you have a grenade launcher and a separate flash suppressor, that is illegal, even though both configurations are equally dangerous to human life. And I included a picture of a pretty girl holding one because, well, Rule 5 is a thing. Now the purpose was not to give you a chuckle at something so girlish and deadly at the same time, although if you did get a chuckle, more power to you. No, the purpose was to point out that under the prior assault weapons ban, this gun was still legal, because it lacked certain cosmetic features that had little-to-no impact on its dangerousness. So for several years there have been a number of secret memos outlining the legal case for drone strikes even potentially against American citizens. Now, I can understand the idea that maybe specific memos should be secret. White House discussions should be given the breathing room, when justified, of knowing that every word is not going to turn up on the front page of the New York Times. That way new, different and controversial ideas can be tested out without fear of, well... pretty much the witch hunt we saw against John Yoo, and Jay Bybee. That includes, by the way, Velvet Revolution (safe link), which is run by convicted domestic terrorist Brett Kimberlin, who has attempted to get them and others disbarred. You know, because if there is anyone who should tell us how to treat terrorists, it is a convicted terrorist. So I am okay with many of these documents being held back under the doctrine of executive privilege. But at the same time, the Administration had a responsibility to create a publicly presentable case on this point. Something that didn’t use specific intelligence, but still explained why it was legal. So today we finally got a document released, referred to as a “White Paper” (because they are racists I guess). You can read the original here, with the accompanying article, or read the wiki transcription which seems to be really close if not perfect. Hey, @aaronworthing! Member when Jesus used the death of 18 ppl (who died when a tower fell) to say REPENT OR PERISH?Me, too! Luke 13:1-5. Hey remember when Jesus picketed the funerals of roman soldiers? @wbcshirl yeah, me neither. Well, that kicked up a firestorm that even made it onto Fox News (quoting me! Cool! ), which you can read about here. So Ron Paul felt the need to clarify. I mean it’s not an apology. It’s not taking it back, it is clarifying what he said earlier. Ron Paul Blames Chris Kyle for His Own Death (Update: Westboro Baptists to the Rescue and I make Fox News! Update: Fyi, if you wish to help with the memorial fund, go here for details. Update (II): Ron Paul gains the support of the Westboro Baptist idjits. Jump to the end for the fun. Update (III): Twitchy reports that Paul controls his own Twitter feed. Update (IV): I made Fox News! See at the end of the article. Or gee, maybe he will pretend this tweet was ghost written without his knowledge, too. "We have lost more than we can replace. Chris was a patriot, a great father, and a true supporter of this country and its ideals. This is a tragedy for all of us. I send my deepest prayers and thoughts to his wife and two children," Scott McEwen, co-author of "American Sniper," said in a statement to ABC News. "His legacy is not one of being the most lethal sniper in United States history," McEwen said. "In my opinion, his legacy is one of saving lives in a very difficult situation where Americans where going to be killed if he was not able to do his job." Read the whole thing. Personally while I am not going to subscribe to any wild conspiracy, part of me is waiting for it to turn out that his shooter was an “American Taliban” type who wanted to score one for the other team. There is nothing I have read so far that backs that up, it’s just a hunch I have. Or maybe I just have difficulty processing that such a deadly American warrior could be taken out in such a stupid way, though obviously that is physically possible. So take that for what it is worth. But unfortunately some people can’t just solemnly remember an American hero. Of course all weekend the gun control ghouls and anti-American types were out in force. They claim to value human life, but they seem to get pretty excited every time someone is killed with a gun. As for gun-grabbers’ point it is actually kind of stupid. No one has ever said that a gun creates a magical force-field that protects you from being shot. No, the only thing a gun does is it gives you a fighting chance when someone comes after you or someone you would wish to protect. There is nothing wrong with figuring out how and why a murder took place and figuring out if there was something different could have been done. If it is verified that this was PTSD gun therapy, and it can be verified that this is what triggered it—something that the defense might assert, but is far from given—then maybe it will suggest that this shouldn’t be done. Or maybe we will actually study the issue and discover that of all methods of therapy, this kind is the least likely to cause a murderous outburst. But making this kind of determination is just called using your head. @ronpaul So all veterans, once done serving our nation with honor, deserve to be murdered as civilians? Wow. So yesterday was the Super Bowl. I admit I didn’t have a strong preference going in, although I am a sucker for underdog stories, so I was rooting for the 49ers right before their hopes were dashed. Still I think it is reasonable to say this. The Ravens were killing them right up until they had a partial blackout. I mean it was a slaughter right until then. Then we had a blackout for a while, and then suddenly the 49ers got the momentum and put up a heroic effort, but it just wasn’t enough. They still came up short. I remember when the black-out occurred that I wondered why they were stopping the game. I mean it wasn’t a complete lights out. It was just slightly dimmer than before. What was the big deal? Later on, a better explanation came in: some of the teams’ electronics were affected, but that still seems to be a bit of a silly reason to stop the game. I mean what did we do before we had all that fancy equipment? And why couldn’t we go back to it, while the engineers did their work? Well, isn’t that the perfect metaphor for energy efficiency? It saves the most power by just not working. In any case, congrats to the Ravens. 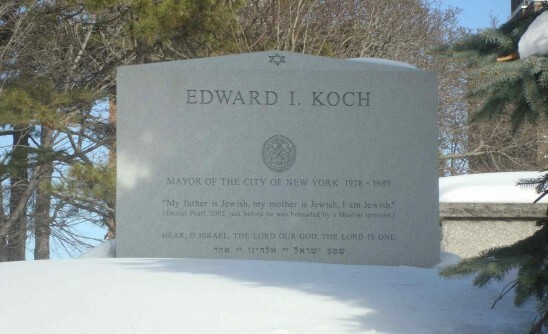 I am sure that Mr. Koch and I had many political disagreements, but he always seemed like a good guy in general and our discourse is poorer without him. God bless Mr. Koch and I hope to meet him someday in heaven. I should be so lucky. Of course regular readers know of Liberal Grouch by now, who I will abbreviate to LG. Here is where I showed how Occupy Rebellion threatened to reveal where Lee Stranahan lived so his wife could be raped while he was at a political convention, and how LG then carried through on that threat to reveal where Stranahan lived. Here is where LG threatened to sue me for truthfully reporting about his conduct and then offering a negative opinion about it, proving beyond any reasonable doubt that he is an anti-speech thug. Here is where his harassment of Lee Stranahan drove Lee to abandon his home. Here is where he tries to threaten Patterico’s job based on statements he claimed was libelous… after previously admitting they were not. Oh and for bonus points, here he is working with Brooks Bayne who supposedly would never work with a liberal or a person without honor. You might have also read Stacy McCain’s profile of the complete loser that is LG, real name Bill Schmalfelt. I don’t normally even bother with him enough to name him, but you will see you need to know his name to follow along what is happening. You might also know the sad story of how Mrs. Stranahan last year was expecting twins. Unfortunately one of the children died, leaving this family with the emotional whiplash of welcoming a new life while mourning the one they just lost. I literally cannot imagine how that feels. And yesterday, LG decided to attack him for it. This is the action of a man who not only lacks ordinary human compassion, but doesn’t even understand the concept well enough to fake it. So to document it for posterity, here are the tweets in question.